Luxury saloon and high performance sports car all in one package? Look no further than the Bentley Continental Flying Spur. The new Bentley Continental Flying Spur has a squarer, more upright grille, bolder lower air intake and slimmer rear bumper to update a car which manages to combine elegance with an almighty road presence. Design cues which distinguish the Speed from its stablemate are subtle but stand out to enthusiasts include dark-tinted radiator, air intake grilles, rifled exhaust tail pipes, “Speed” tread plates on all four doors and unique multispoke 20-inch multi-spoke alloy wheels. Looks combine luxury with a clear indication this is a car which means business. The Flying Spur Speed model features its own three-spoke leather steering wheel (four spoke for the regular Spur), aluminum fascia panel, sport foot pedals, chrome/hide gear lever and diamond-quilted hide. Craftsmanship reveals the fruits of a labour-intensive process which brings swathes of quality wood, chrome and veneer. The main cabin enhancement has been noise reduction, detailed in the performance section. Multilayer seats make finding a comfortable position inevitable with quality massage feature too. Getting into a car which has been hand-stitched and lovingly-crafted over weeks rather than rolling off a production line within a matter of hours comes with a real sense of personality and unmatched occasion. The Bentley Flying Spur Speed can be specified with four or five seats, the four seat model we drove provided unsurprisingly luxurious amounts of interior space with plenty of interior storage space. The automatic open and close boot can swallow 475 litres of luggage. The car’s size means manoeuvring is initially a challenge. It took us a couple of days to get the hang of the sheer size of the car but familiarity improved this. Bentley has improved the Continental Flying Spur’s driving dynamics with retuned steering and revised spring and dampers, anti-roll bar and damper settings as well as performance Pirelli UHP tyres. The new Speed model shifts the focus to handling with a 10mm lowering in ride height, redesigned aluminum suspension, superior grip from bespoke Pirelli P-Zero performance tyres and further retuned steering to improve agility and control. As mentioned above the first couple of hours behind the wheel of a car with this level of performance and the weight required to tick the luxury boxes demands respect, but after that the smile just gets broader. Some have queried the loss in comfort on the Speed compared to the regular model but our rear seat passengers were more than happy. The 12 cylinder Continental Flying Spur Speed is Bentley’s most powerful four-door car ever. Its two-door GT Speed-matching performance comes from the same twin-turbocharged 600bhp tuned engine. This powers the all wheel drive car from 0-60mph in 4.5 seconds and on to 200mph via the six-speed ZF automatic gearbox. Steering wheel-mounted shift paddles are standard. This performance compares with 552bhp from the regular Spur which has a 0-60mph time of 4.9 seconds and top speed of 195mph. The respective maximum 553lb/ft (750Nm) and 479Ib/ft (650Nm) pulling power is available across virtually the entire rev range from 1600rpm. The W12 sound is pure class and benefits from a retuned exhaust system while luxury saloon living means double glazed windows have been supplemented by further noise-reduction measures including acoustic glazing, trilaminate body undertrays, wheerlarch liners and retuned exhaust. 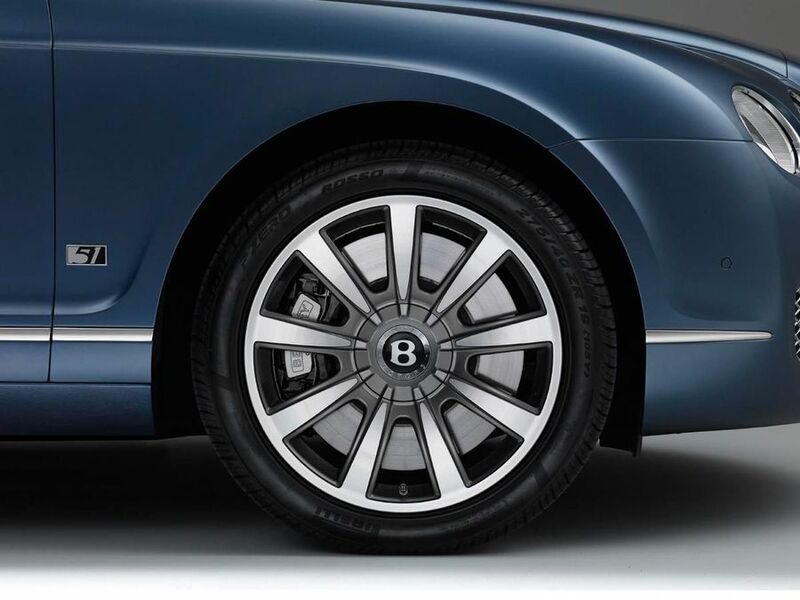 Flying Spur brakes are the largest on any production passenger car on sale and the 20-inch wheels which accompany the Speed can be equipped with carbon ceramic brakes. It’s this technology which means the Bentley can double as super-smooth saloon and high-performance sports car. Needless to say its unlike driving anything else and takes a few days to get used to. Then you don’t want to give it back. The Bentley Continental GT Speed is the product of many hours painstaking construction and benefits from the input of know-how and parts from parent company VW. It’s built to last. The Electronic Stability Programme (ESP) has been updated and once-again VW safety benefits a rock solid build quality. There are not many cars you’d swap places for if the worst came to the worst. Standard equipment on the Flying Spur in addition to that already mentioned includes keyless entry and ignition, automatic wipers, burr walnut fascia, front and rear console and door inserts, choice of 17 interior hide colours, four-zone climate control, electric seats with heat and memory settings, telephone system, satnav, 6CD changer, breitling clock and cruise control.. Standard equipment on the Flying Spur Speed is listed within the looks inside section. Options include a sophisticated adaptive cruise control which allows motorists to take a break from the fun side of the Flying Speed and enjoy the luxury.The radar-based, follow-to-stop system scans traffic ahead to maintain one of five selected time gaps up to the maximum speed of choice. There is also the new tailored-for-Bentley 1100 watt, 15-speaker NAIM sound system to enjoy. Bentley also offers a new iPod, MP3 and USB interface located in the glovebox and headrest-mounted 7-inch LCD screens and DVD multi-changer. Plus there is a broader range of interior and exterior finishes to choose from including a range of 16 different seat piping colours. You can have your cake and eat it – if you can afford it. If you want ultimate luxury and more driving power and fun than you could shake a whole forest of sticks at the Bentley Continental Flying Spur Speed awaits.